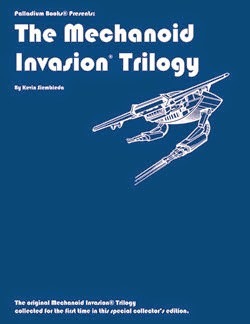 Sphere of Annihilation: Mechanoids Invasion Trilogy! Palladium Books just released a reprint of their first rpg, Mechanoids. They put a pdf up for sale a few years ago, but recently Kevin Siembieda announced that they were going to do a limited print run of the book due to popular demand. I received my copy in the mail today. This book collects three games/supplements and puts them together in one book. One of the coolest features is that in the beginning there is a short history of Palladium books. Another cool feature is that the rules for Mechanoid have not been changed. There are some conversion notes if you are interested in using it with newer Palladium games, but otherwise the rules are as they were written over 30 years ago. This is neat in that it is a historical document of gaming. These are bare bones rules that are only a few degrees removed from the original edition of D&D. I would not call them smooth or complete. The chance of hitting a normally clothed person in combat is 95%. Kudos to Seimbieda for admitting that he mentioned alignment but did not print the actual alignment rules until the third supplement. These will take some house ruling to run well. The setting of the game involves humans fighting against a superior alien force. Think of Falling Skies, new Battlestar Galactica, or The Terminator. In fact, the humans are so desperate to escape that in the second book they invade the Mechanoids main ship and survive on it as stowaways. The mood of the game is one of desperation and survival. I would run this game tomorrow if I found a willing group. The rules may be dated but they are also short. My style is to have minimal rules which I can add to and modify. The genre of the game is unique and one which I have always enjoyed in science fiction. I would recommend this book to Palladium fans, rpg historians, and sci-fi nuts who haven't found a good alien invasion game yet.